Formulated with Eco-Certified DHA and Erythrulose for a long lasting, beautiful tan. Start your tan with Perfector to balance skin’s pH for an even, deep tan and see results in as little as 2 hours! Formulated with Grape Seed Extract to help stimulate collagen and improve skin appearance. Green Tea Extract to help reduce free-radical damage and environmental stress on the skin. Will my skin look orange? No. The advanced technology currently used in sunless tanning solutions is designed to ensure a natural, bronze tan. The salon staffer can help you select the proper level of tanning solution to best match your skin tone. What is Sunless Spray Tanning? Sunless spray tanning is the spray/mist application of Sunless tanning solution to your body. When applied, DHA (the active ingredient in Sunless tanning solution) reacts with the proteins in the skin’s superficial layer to form a golden brown color. Your skin begins to darken two to three hours after application and reaches its peak color within 24 hours. The color will gradually fade through natural exfoliation, just like a tan from the sun. How should I prepare for my Sunless Spray Tanning Session? Exfoliate and shave the day before or the day of the sunless spray tanning session (day before is preferred). The day of the Sunless spray tanning session refrain from using moisturizers, perfumes, lotions, oils or deodorants that may create a barrier between the skin and the Sunless tanning solution. You may resume using these after your first shower or bath. How long should I wait after a session before showering? To give the DHA enough time to fully set, it is recommended to wait a minimum of 4 hours after a sunless spray tanning session or 8 hours for optimal results. Showering sooner may diminish the intensity of the tan. If you tan using an Instant Cosmetic Bronzer, the Instant Cosmetic Color will wash off in the shower, but the color produced by the DHA will remain. Will swimming affect my tan? Swimming in chlorinated water or salt water can fade the Sunless Spray Tanning results, cause possible streaking and will diminish the length of your tan. However, normal activities such as bathing, showering or physical activities will not affect the quality of the tan. Does Sunless Spray Tanning Solution have any smell after contact with my skin? 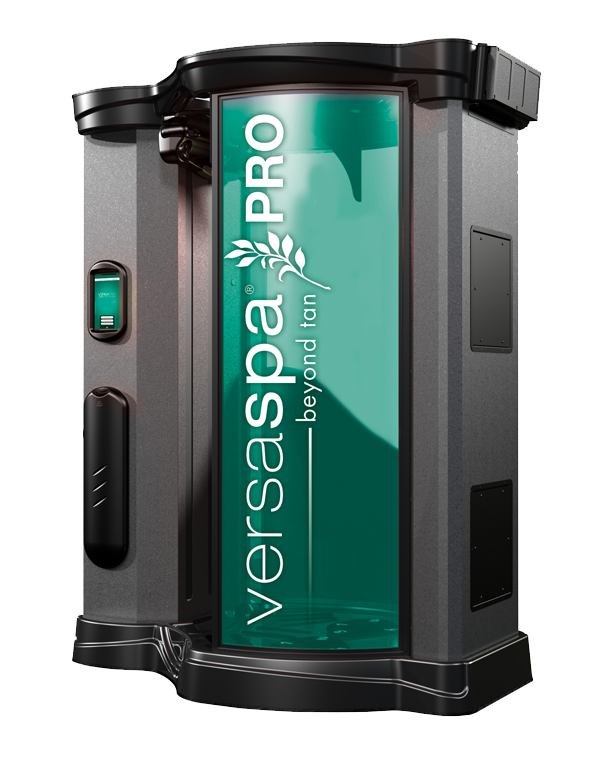 Mystic Tan and VersaSpa sunless spray tanning solution use a breakthrough odor control technology designed to virtually eliminate the odor that may be present when the solution interacts with the skin. Will the bronzing formula stain my clothing? No, the sunless spray tanning solution which includes a cosmetic bronzer is water soluble and will be removed after the next wash in cold water. However, in some instances, the DHA in the tanning solution may permanently stain undergarments worn during the spray session. How long does Sunless Spray Tanning last? A Sunless Spray Tan can last up to 7 days depending on the formulation you choose and the condition of your skin. Are there ways to enhance the Sunless Spray Tanning results? 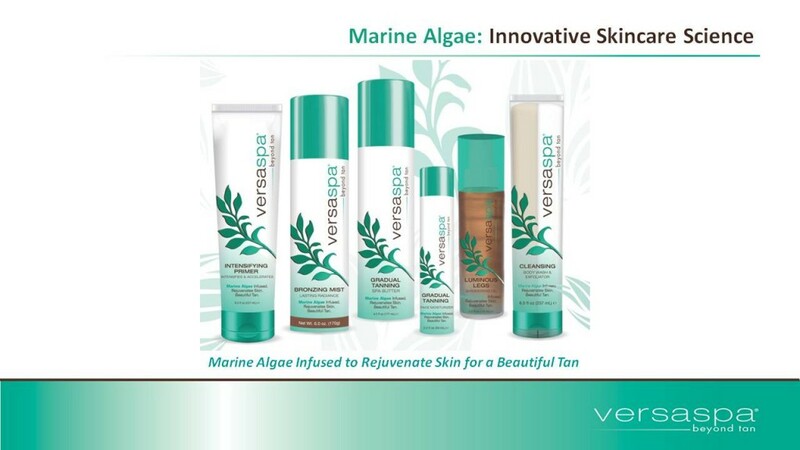 Yes, all VersaSpa at-home products are created to enhance and extend Professional Sunless Spray Tanning results. 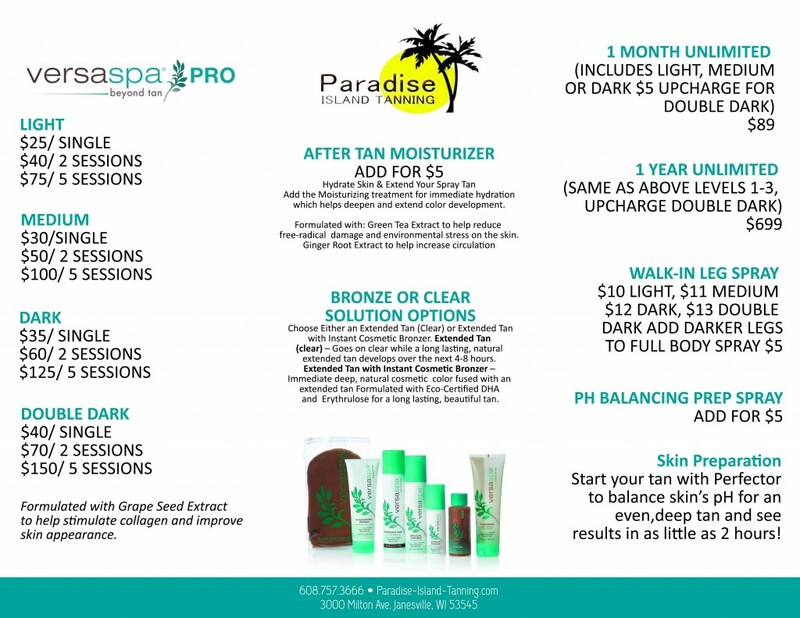 Over the counter products are not formulated for Sunless Tanning. They may block the tan’s application, impede the development process, and create uneven post-tan fading. Ask your Salon Professional about MysticTan’s complete line of in-home Sunless Products to enhance and extend the life of your Professional Sunless Spray Tan. What is DHA? The active ingredient most often used in all sunless tanners including tinted moisturizers, self-tanners, and spray tan solution is called Dihydroxyacetone, or DHA. DHA is a carbohydrate (monosaccharide sugar) compound approved by the FDA for use in externally applied sunless tanning solutions. For misting applications, the FDA recommends protective measures to prevent eye contact, inhalation or ingestion. DHA is often derived from a vegetable source like beets or sugar cane. The FDA added DHA to the list of approved colors for cosmetic products in the 1970s. Is the DHA in Sunless Spray Tanning solution safe to use? 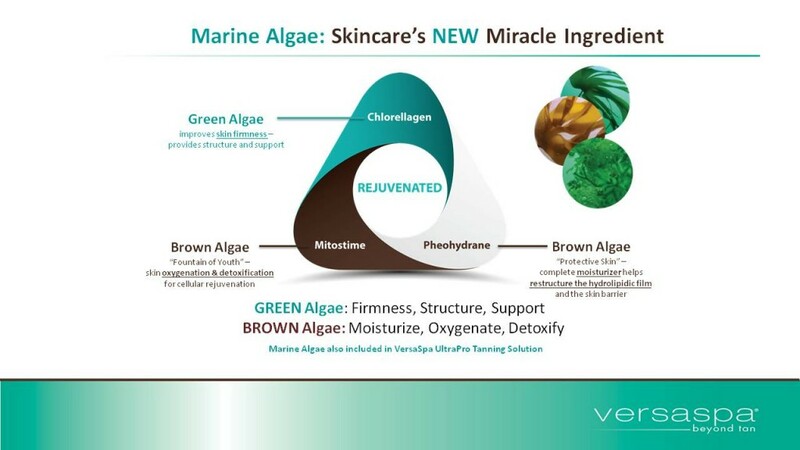 The FDA has approved DHA for external application to the skin. For misting applications, the FDA recommends protective measures to prevent eye contact, inhalation or ingestion. To ensure complete protection, the FDA suggests wearing protective eyewear, nose filters, ear plugs, lip balm, and undergarments. Is Sunless Spray Tanning Solution recommended for people with skin sensitivities or allergies? This product is safe, however, for those with skin sensitivities or allergies, it is recommended to consult a health care professional before using the product. What happens if Sunless Spray Tanning solution gets in the eyes? FDA recommends that DHA not be used in the eyes or surrounding area. Protective eyewear is recommended and can be supplied by the salon. If eyes feel irritated, gently splash with water. For additional questions or if irritation persists, consult a health care professional. What happens if Sunless Spray Tanning solution is inhaled? FDA recommends that DHA not be inhaled. Nose filters are recommended, which can be supplied by the salon. For additional questions or if irritation persists, consult a health care professional. What is the Sunless Spray Tan (FDA) advisory? The FDA advises that users avoid inhaling or ingesting DHA or letting the spray get into the eyes. When using DHA- containing products as an all-over spray or mist, it may be difficult to avoid exposure in a manner for which DHA is not approved, including the area of the eyes, lips, or mucous membrane, or internally.